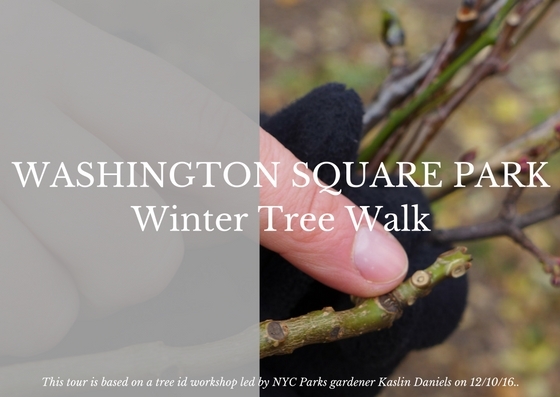 On a very cold Saturday morning last December, Kaslin Daniels led an intrepid group of tree enthusiasts on a winter tree identification walk in Washington Square Park. Kaslin is a NYC Parks gardener and the lead gardener at WSP. We met beneath the centuries old English elm in the northwest corner of the park. Kaslin started of the workshop with a short lesson in what she called "tree detective work". 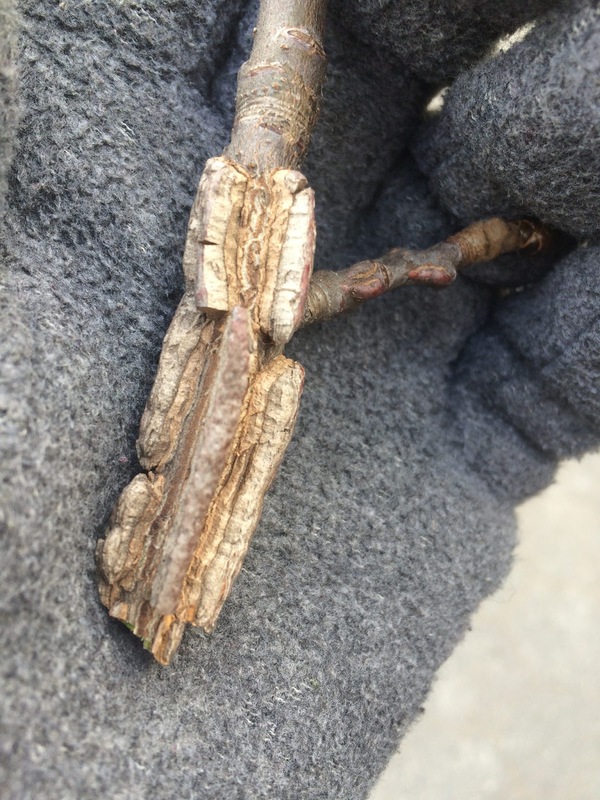 To gather clues, we were directed to consider the growing habit or form, the bark, the twig (and its buds), and any persisting fruit or leaves (for the latter, oaks are a good example). Kaslin had branch and twig samples that she used to illustrate her lesson. As we walked she introduced more detailed terminology as relevant to the species we were examining. Once she concluded her introductory remarks we set off and below I outline the route. This 300+ year old elm is perhaps the most famous tree in the park! Elms are a vase shaped species. The English elm has fuzzy buds. From this tree we walked east to an even older tree (species). This species has an excurrent or central leader. The dawn redwood and bald cypress look very similar. One way to distinguish between the two is by looking at the leaf arrangement. Bald cypresses leaves are arranged alternately on the step. A mnemonic is ABC meaning alternative bald cypress. From there we walked east and looked south unto the lawn. I think this particular tree is actually an American sycamore (Platanus occidentalis) because of the white-toned camouflage of the bark. London plane trees tend to have yellow or green toned camouflage patterning. This tree is listed as American sycamore on the WSP Eco Map. I will confirm with leaf and seedball comparisons. Read more about the differences between these two species here. From the plane tree we looked at two small trees growing adjacent to the tot playground. A participant was curious about the crape myrtle so we looked at that tree before spending time at the magnolia. One of the identifying features of the saucer magnolia is its fuzzy terminal bud. We moved off the path unto the lawn just west of the fountain for a closer look at a catalpa and a pagoda tree. This catalpa growing across from the tot playground is one of two Northern catalpas in the park. The other one is just slightly east of the Holley bust. A defining feature of the catalpa is whorled arrangement of the terminal and lateral/axillary bud. Most twigs are a shade of brown but the twigs of the pagoda tree are green. (Note: a twig is previous year growth while stem is current year growth. Stems tend to be green.) Another characteristic of the species is the presence of a pseudo-terminal bud. The pseudo bud mimics a terminal bud but is in fact a lateral bud. Look for a leaf scar. Learn more about bud types here. Our next large statured tree was across the central path in the lawn across from the comfort station. Like the dawn redwood, the ginkgo is a prehistoric tree. In leaf, the species' leaves are distinctive -- they are two lobed and fan shaped. In the winter season, look for vertical furrows in the park and spurs on the twigs. Just south of the ginkgo growing in the same lawn are Japanese cherries and a red oak. There are two groves of cherries at the Thompson entrance to the park. The showy flowers of the northernmost grove make me think that the cultivar is 'Kwanzan'. The flowers of the southernmost trees are more delicate and remind me of the Yoshino variety. Regardless of season, one defining feature of the Japanese cherry is the prominent lenticels on the bark which are arranged in horizontal rows. A lenticel is a gas exchange pore. 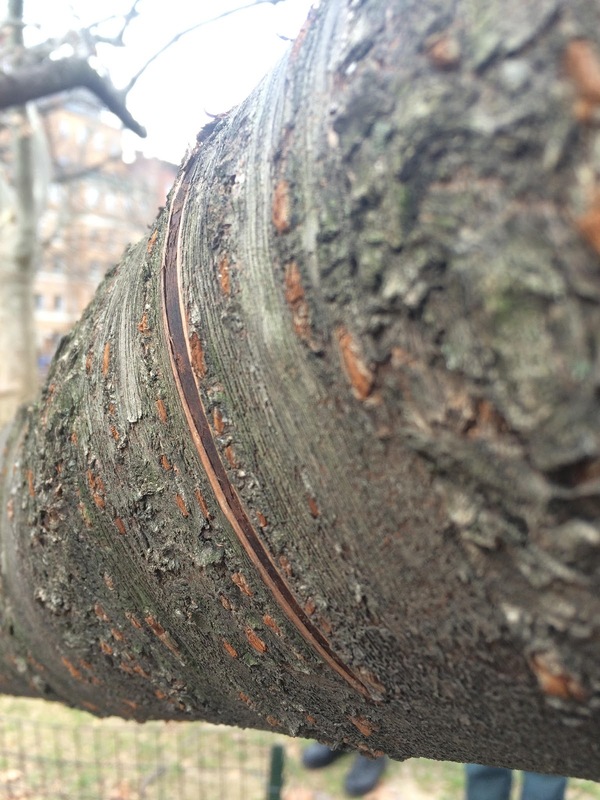 Did you know that the bark of the red oak has a "ski track" pattern? A red oak's bark changes with age so be mindful of this variation. If you are tall enough or a branch is low enough, look for a clustered terminal bud which means that the terminal bud is surrounded by several lateral/axillary buds. Curious about variability in bark, twig (and bud), and fruit? Read here. Our next two trees have genus names beginning with the letter "L". The tulip tree is one my favorite tree species. Imagine a lush canopy of vibrant green leaves generously sprinkled with lush tulip flowers. In late fall and winter you might see the base of the seed head persisting on the tree. The seedpods are held upright on the twig. Also look for duck bill shaped buds. The sweetgum has persistent seedpods, too. The balls are spiky. Another element to look for is corky twigs. We were also shown red (Acer rubrum) and sugar (A. saccharum) maples twigs. At this point, Kaslin presented the option to conclude the workshop or to see additional trees. About half of the group peeled off the tour. The temperature had dropped and we were all uncomfortably cold. My camera battery had completely drained and my pen ink had frozen. I could not take more notes or photographs. The remaining participants walked further east then north and were shown black locust (Robinia pseudoacacia), hawthorn (Crataegus spp. ), and honey locust. We did not stop at the white ash (Fraxinus americana), golden rain tree (Koelreuteria paniculata), or little leaf linden (Tilia cordita). The honey locust we looked at is a street tree on the NW corner of Waverly and University Place. You can find honey locust growing in the sidewalk on the western edge of the park. At the Washington Place entrance you will find a honey locust or two growing in the park. I'd like to tag the tree stops on a Google map so you can have a mobile map for your next walkabout in Washington Square Park. Stay tuned! 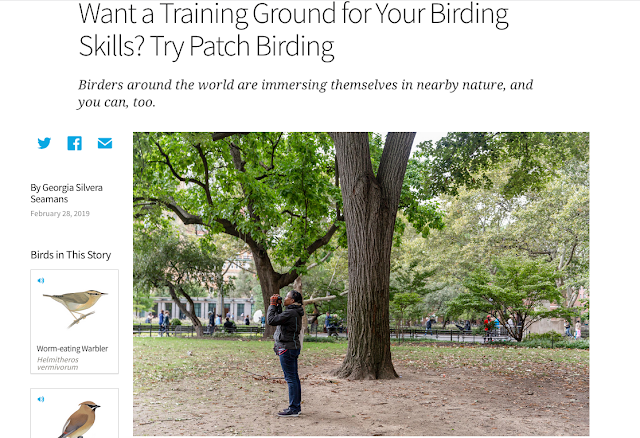 This workshop was co-sponsored by Washington Square Park Conservancy and Washington Square Park (WSP) Eco Projects.